Apparently on March 1, 2012 Google is doing away with Google Friends Connect. GFC will no longer be available to non blogger blogs all over the world. So if you don't use blogger.com you will no longer be able to use Google Friend Connect. Google wants to focus on Google + and encourage folks to use Google +. Here is a list of other ways to follow Christine's Pantry. Like Christine's Pantry on Facebook. Follow Christine's Pantry on Pinterest. Follow Christine's Pantry through RSS feed. Subscribe via email, enter your email on the sidebar. The folks who follow Christine's Pantry I hope you will take time to follow Christine's Pantry through the other avenues listed above. I'm sad to see GFC disappear. I am very, very thankful for the support. Thank you for being a part of Christine's Pantry. Cilantro is one of those foods that people either love or hate. Interestingly, the regions of the world where it is most cherished are not where it originated. Cilantro’s genesis can be traced to the Mediterranean. The Romans spread it to Asia while the Spanish conquistadors introduced it to Mexico and Peru. Subsequently, cilantro is a primary herb in Indian, Asian, and Latin American cuisines while Europeans and Americans have given it a lukewarm reception. Nevertheless it is touted as the world’s most popular herb. Cilantro’s nomenclature is somewhat confusing. The entire plant and the seeds are properly named coriander, while the leaves alone are cilantro. Colloquially, the entire plant and leaves are referred to as cilantro and only the seeds as coriander. Cilantro is also referred to as Chinese parsley. Cilantro has been used for thousands of years. Coriander seeds have been found in ancient Egyptian tombs. The Chinese believed it to be an aphrodisiac and to produce immortality. Coriander, like many foods throughout the ages, has also been credited with a number of medicinal properties. Cilantro is available year round. It is a delicate herb that fades quickly. Most supermarkets carry it but finding fresh, non-wilted specimens is the challenge. Choose bunches with bright green leaves and a fragrant aroma. Store it in a plastic bag or place the roots in a container of water with the tops covered by plastic wrap or a bag. Either way, in a few days it will be a shadow of it’s original self. Coriander seeds and/or ground coriander can be found in the spice aisle of most supermarkets. As with all spices it is best to purchase the seeds whole and grind them yourself for the best flavor. Cilantro stems are also edible and provide a bright crunchiness to your dish. Add cilantro leaves toward the end of cooking or just before serving. Its fragile flavor is easily dissipated by heat. Americans are most familiar with cilantro in their salsa and guacamole. However, cilantro and coriander are used all over the world in countless preparations. It is used with meat, chicken, fish, sauces, marinades, chutneys, you name it. Coriander is even used in baking. Place yogurt in a strainer lined with a paper towel and set the strainer over a bowl. Let the yogurt drain and thicken overnight. Combine yogurt, taco seasoning and cilantro, mix well. To assemble, in 11x15 dish, spread refried beans, then spread yogurt mixture, then spread guacamole, salsa, lettuce and cheese. Enjoy! Great recipe, my guys would love this one. Great dip...I make one similar with sour cream. Hope your having a great weekend Christine! I don't really like cilantro but I love just about anything else Mexican related. This looks like a yummy dip! Looks delicious - I'm a cilantro fan! It goes in all my salsa & guacamole recipe! Thanks! And the dip? As long as get the recipe, we're happy. This sounds like a winner and thanks for the info on how to make sure we keep getting your great tips and recipes. Yum...I would eat this up like crazy!! I like cilantro in small doses, so I usually just cut back on whatever a recipe calls for and am good! This looks super delicious! I love dips, they're one of my favorites :) Great recipe Christine! 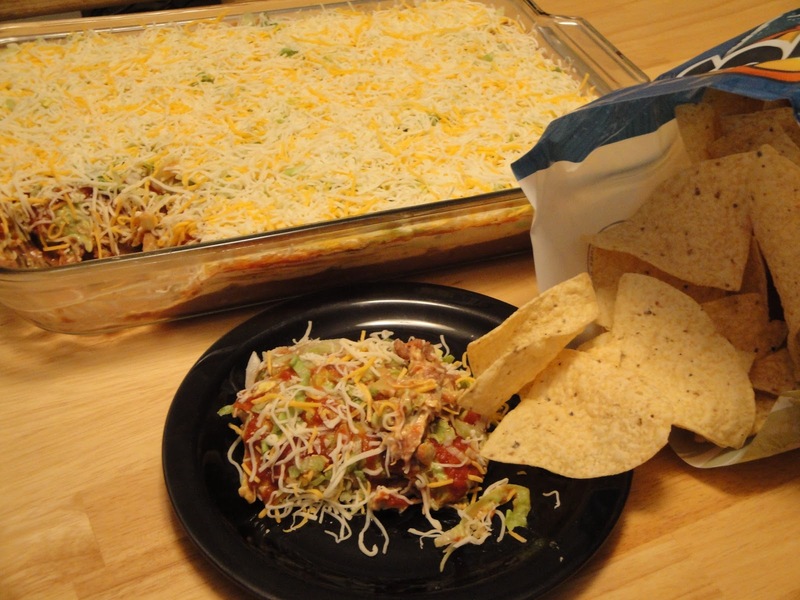 who doesn't LOVE a great taco dip! I just came across a Taco dip cheesecake style. Looks pretty good, I'll be trying it soon. Yummy! This is a perfect dip for all occasions, Christine! This would be a great recipe for a party! This dip sounds amazing! I know what you're saying about cilantro. I once put some in a salad and my youngest son accused me of trying to poison him. lol He hated it! Yummo - I'm a big fan of coriander (its leaves and its delicious roots that most people throw away).